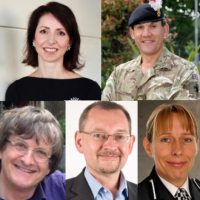 Five Fitzwilliam College alumni have been recognised in this year’s Queen’s Birthday Honours. Col. Mike Butterwick (History 1990 - top right) was awarded a CBE for his work with the British Muslim community during his time as deputy Commander of 4th Infantry Brigade based at Catterick Garrison in North Yorkshire. Professor John H. Hardman Moore FBA FRSE (BA Mathematics 1973 - bottom left), Professor of Political Economy at the University of Edinburgh and Professor of Economic Theory at the London School of Economics, was awarded a CBE for services to Economics. Dr Andy Harter FREng (BA Computer Science 1983 - bottom centre), founder and CEO of RealVNC Ltd, was awarded a CBE for services to engineering. Mrs Jane Sawyers (MSt 2009 - bottom right), Chief Constable of Staffordshire, was awarded a Queen’s Police Medal (QPM).